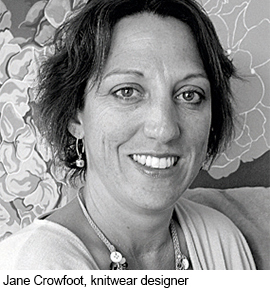 Jane Crowfoot has been a strong supporter of Knit for Peace. Having led a successful Knit for Peace Holiday to Mysore this year, she has finalised her plans to also lead a really exciting knitting workshop programme which will start in June at our HQ in London. We are really excited about the tutors and subjects that she has lined up for these workshops and will give you more information about them very soon. In the lead up to the workshops, Jane Crowfoot will also be holding monthly prize draws which will give you all the chance to win a piece of knit or crochet design simply by making a small monetary donation to Knit for Peace via PayPal – you can choose how much you wish to donate (minimum £1 or equivalent) and can enter as many times as you like. 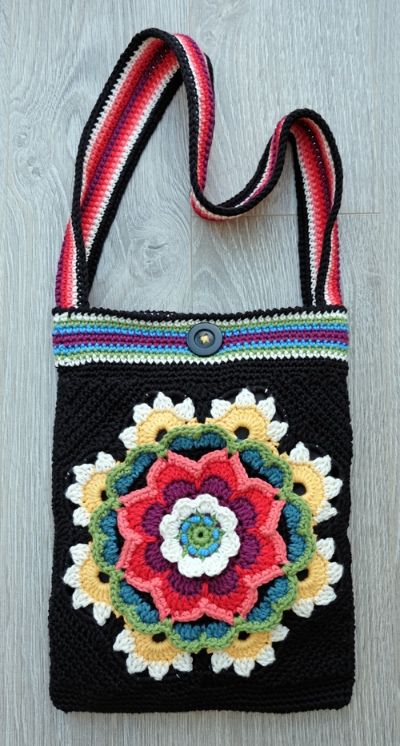 To kick off the prize draw Jane has donated her completed ‘Flowers of Life’ crochet bag – pictured below. This is a ready made item so it could be the perfect gift for a loved one or a very welcome present to self. You have until Friday 29th April to enter the draw and we will reveal the winner within the first few weeks of May. Follow this link to make your donation and therefore enter the draw. Jane Crowfoot studied textile design at Winchester School Of Art in the UK where she specialized in knitting. Following graduation Jane worked as a freelance textile designer. She has worked as a Design Consultant for Rowan Yarns whilst also working with Debbie Bliss. Jane tutors many knitting and crochet workshops across the UK offering hands on advice to knitters through teaching and demonstrations. She spends most of her time designing knit and crochet projects for the home interior. Jane is the author of 5 books, the most recent being Homespun Vintage and Kaleidoscope. She lives in North London with her husband, two teenage children and her Staffordshire Terrier – Scramble. In her spare time Jane enjoys cookery, gardening and painting. Jane also has her own blog, a newsletter that let’s you know everything she has been up to, and a website with lot’s of amazing patterns, knitting and crochet tips, as well as some beautiful knitwear to buy. You can also follow her on Twitter @JaneCrowfoot and like her page on Facebook. If you sign up to one of the Knit for Peace workshops you’ll also be able to meet her in person and learn a new skill or two from a distinguished knitwear designer.